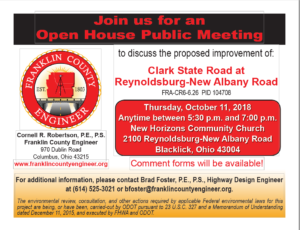 A public meeting will be held on Thursday, October 11 from 5:30 pm to 7:00 pm to discuss the proposed improvement of Clark State Road at Reynoldsburg – New Albany Road. The meeting will be conducted in an open house format. There will be no formal presentations, but personnel representing the Franklin County Engineer’s Office will discuss the need for improvements at this location. Everyone will have the opportunity to express their views about the project by submitting a comment form that will be available during the meeting or can be downloaded here. A public meeting will be held on Monday, August 6 from 5:30 pm to 7:00 pm to discuss the proposed improvement of Leppert Road north of the Heritage Rail Trail. The meeting will be conducted in an open house format. There will be no formal presentations, but personnel representing the City of Hilliard and Franklin County Engineer’s Office will discuss the need for improvements at this location. 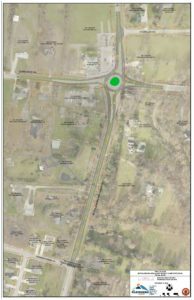 A public meeting was held on Wednesday, September 7 to discuss the proposed improvement of Smothers Road at Schott Road-Redbank Road. The meeting was conducted in an open house format. There were no formal presentations, but personnel representing the Franklin County Engineer’s Office were present to discuss the proposed improvement. Comment forms are available here and must be completed and returned to 970 Dublin Road, Columbus, OH 43215 by September 21, 2016.